Fort Ord (121.820W 36.632N) was the most important Army base on the U.S. West Coast in 1941, covering some 28,600 acres (11,570 hectares). Located just inland from Monterey Bay, south of San Francisco, Fort Ord was well placed as an assembly area either for troops defending San Francisco or troops preparing to ship out. 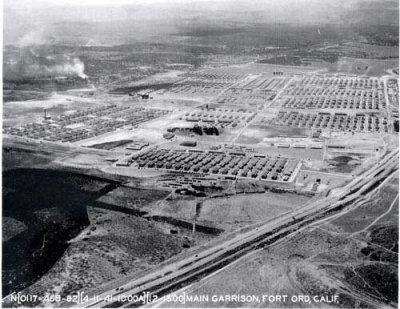 Fort Ord was founded as a cavalry post in 1917, when the government purchased 15,000 acres (6000 hectares) of land near the Presidio of Monterey, the former Mexican military headquarters. Originally used for training maneuvers, the base was rapidly transformed into a permanent post, at the cost of over $13,000,000, beginning in August 1940. By late 1941 it was headquarters of III Corps and based 7 Division, 53 Regiment, and 19 and 47 Engineer Regiments. It served as a major training center throughout the war for divisions destined for both the Pacific and European theaters. Only those units that deployed to the Pacific are included in the tables below.